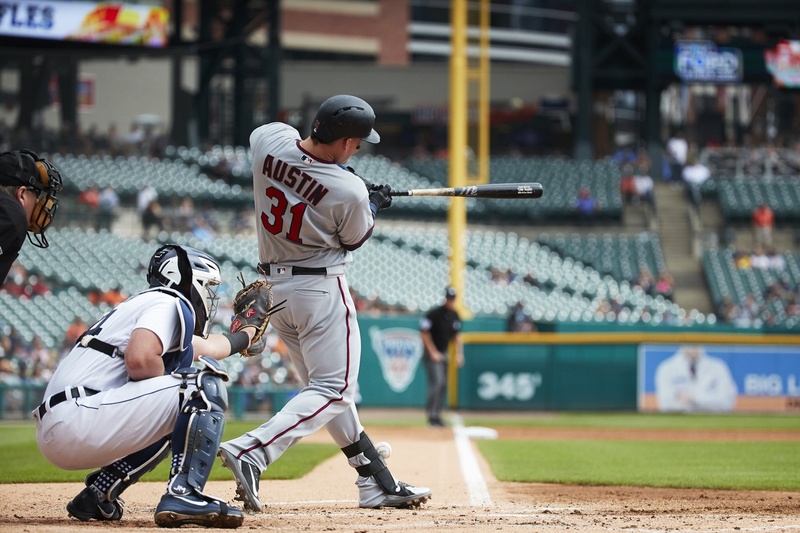 FT. MYERS, FL – After being acquired from the Yankees last July, Tyler Austin quickly caught the attention of Twins fans with his incredible power, launching nine homers with a .488 slugging percentage in 35 games for Minnesota. The immensity of his strength was easy to see. This spring, he is once again generating buzz with his explosive production at the plate. But will this buzz translate into a spot on the Opening Day roster? That's quite a bit harder to see. Austin is among the Twins leaders in Grapefruit League plate appearances with 42, and in that sample he's batted .381 with a 1.024 OPS and three home runs. His easy power has been on display once again coming off a season where he launched 17 bombs in just 69 games between New York and Minnesota. Austin is out of options, meaning that he'll need to pass him through waivers in order to stay in the Twins organization if he doesn't make the 25-man roster out of camp. And since he's been outrighted in the past, Austin could elect free agency even if he goes unclaimed. So, if the Twins don't take the 27-year-old north, there seems to be a very good chance they'll lose him. And that's a disconcerting thought, because it's not hard to envision a scenario where he's one of the more intimidating (and affordable) power bats in the league over the next few years. Contemplating this dilemma, I asked two of the guys who will be primarily responsible for shaping the Opening Day roster about it. "Certainly it gets harder as you start kind of adding more people to the group of first base, DH," acknowledged Chief Baseball Officer Derek Falvey. He did note, however, that the flexibility across the rest of Minnesota's bench might make the notion more palatable. "We have a lot of multi-position players among the other bench-types that afford us an opportunity maybe, whereas a traditional bench you have your catcher, then you have your infielder, your outfielder, something like that." This is true. Through a pure roster-building lens, it's not infeasible you could carry Austin – while sending down a player with options remaining, like Jake Cave or Willians Astudillo – and still have all of your needs covered in terms of positional depth. But from a day-to-day operational standpoint? Things get trickier. "Tyler is certainly one of those guys that has put himself in a position where you are looking to find ways to get him in there," said manager Rocco Baldelli. "Because you know if you get him at-bats, that you feel good about him succeeding. So yeah, it's definitely something that I spend a lot of days thinking about, for sure." The caveat of his statement – IF you get him at-bats – reveals the ultimate problem. Here, the answers seem to run out. Where are Austin's at-bats coming from? C.J. Cron and Nelson Cruz are locked in as starters at first base and DH, which are the only positions Austin plays (the Twins clearly have no interest in using him as an outfielder). And both of those players swing from the right side, so you're not gaining any kind of platoon advantage that'd justify rotating him through those spots regularly. At best, Austin's probably starting once a week to spell one of those guys, while pulling in the occasional pinch-hit at-bat. Not only is this a suboptimal use of a roster spot, but it's also completely unfair to Austin. You can't expect a hitter to produce with such sporadic playing time, and this is quite problematic when said player's value is tied solely to his bat. From a logical view, I think we all have to acknowledge that as long as Cron and Cruz stay healthy for the next week, Austin isn't making this team. It's clear that both Falvey and Baldelli would love to keep him around, but neither could offer a specific rationale for doing so given the layout of the roster. And that's because there just isn't one to be found. The manager can keep spending his days thinking about it, but no answers are going magically emerge. So, with one week left to go before Opening Day, it comes down to figuring out what to do with him. Obviously the Twins want to avoid a scenario where they lose a talented player for nothing. But strikeout-prone sluggers with no positional flexibility aren't in demand these days. And perhaps this reality might portend our ideal outcome: Austin slips through waivers because other clubs are facing similar roster crunches, and he accepts the assignment to Triple-A because he recognizes an MLB job is not available at the moment. Minnesota's depth at first base and DH will look a whole lot better if Austin's a phone call away in Rochester.